Fell free to post your ideas. 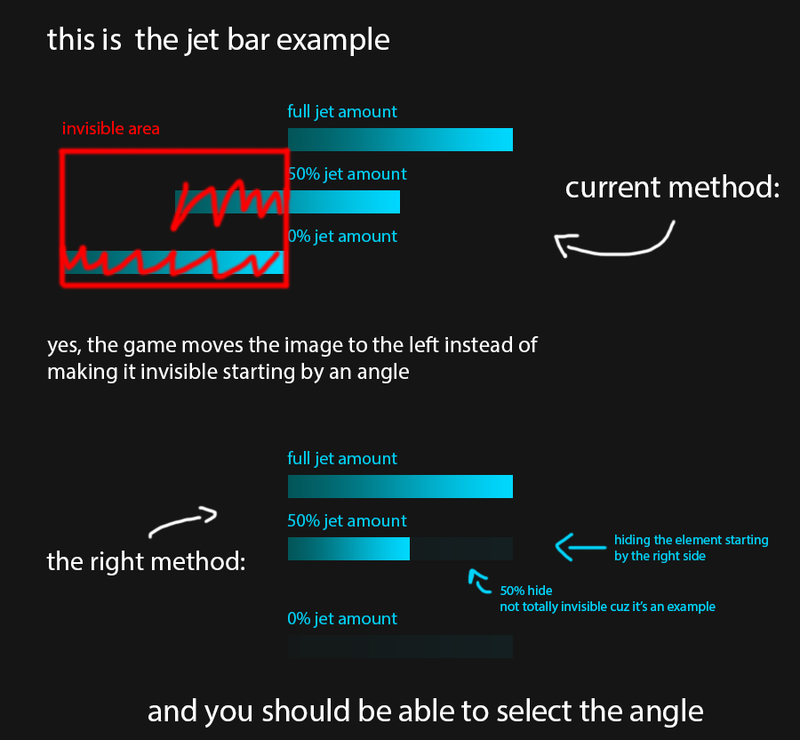 - Rename the files: Ammo to ammo_bar, reload-bar to ammo_amount, health to health_bar, health-bar to health_amount, jet to jet_bar, jet-bar to jet_amount. - Add the vest_bar and rename the vest-bar to vest_amount. - Split the noflag element to noflag_blue and noflag_red. - Split the Team Box area to the elements 'score_blue', 'score_red', 'noflag_blue' and 'noflag_red'. - Add new elements to the flags not captured. flag_blue and flag_red. - Add the option to use text instead of the nade (nade and cluster-nade) images. - Add the option to use images instead of the weapon text. 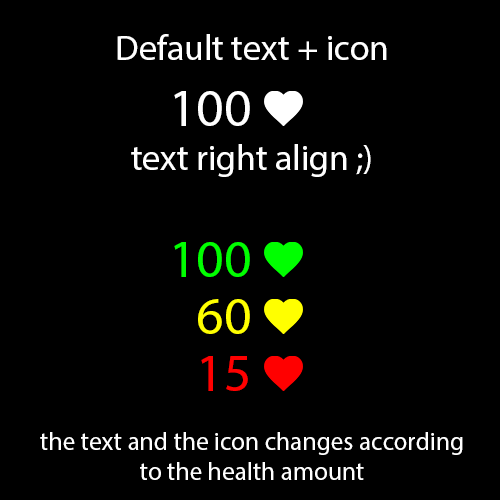 - Ability to change the color of the texts and set different colors based on the amounts (example). Plus an option to apply color transitions would be great too. Eg. : 35 of health could be something between yellow and red. 80 something between green and yellow. - Ability to set different images based on specific amounts or (if easier to implement) a color overlay (similar to Photoshop and other editors) to change element's color (example). - Remove the % character that follows the amounts. - Add interface objects hierarchy w/ option of following. - In further consequence - add an option of following gostek's screen position. It means - in this case you are able to set for e.g. the crosshair as a parent for another element, for example ammo bar. The ammo bar, child of crosshair, would be following it with constant offset. Ammo bar can be in the same time a "subparent", forcing ammo amount bar and ammo text to follow it, and in consequence - to follow the crosshair. This would make easier to edit positions of interface elements, because you won't have to align bars and background frames manually. It would also make you able to "build on" more complex crosshair. The same thing with gostek. For example you would be able to assign the health bar to him to follow his position on screen.